I received this late last night, and it gives us some insight on Tau playtesting that is going on at the moment. Everything from a Tau Dreadknight type walker to a new Kroot Huge Monster is here. Please remember that these are playtest rumors. I have been seeing a lot of play testing for the tau empire and have seen some new models as well. They look so new and epic it makes me really excited. Now I did my hands on some rules and names for units, If you are to pass these on then PLEASE send it to only reliable rumour sites. 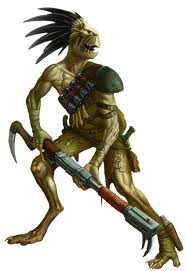 The kroot is getting a HUGE monster that looks like something from fantasy. It has kroot riding it but is under going constant rule changes due to either dying to quickly or for lack of usage. From what I remember seeing it has 5 wounds but only a 5+ save and was over priced IMO. kroot gain furious charge and move through cover and start with a 6+ save that can be upgraded to 5+ with shaper for an additional 2pts per model (making them 8pts per model) - remember this could change! finally their is options to make all your battle suits have 2+ saves for 20pts per model - all war gear that is in the current codex has been reduced slightly. the tau dread knight walker rumours you have read are 100% TRUE - I have seen the concept art/profile and from the top of my memory it is something like this. note the points were highlighted in red marker which means they are subject to change at next play testing. There have been false rumors many times before...so I'll believe it when I see it. I completely agree the things that make my sodium intake a lethal dose is the T5 Crisis Suits and the Orbital Barrage on the Skyrays. Sounds very wishlisty to me but the rumors say that Cruddace is the other so who knows.